Today we will analyze data, news and editorials of journalists and people opposed to mining in Guatemala. Our desire is to review and provide possible solutions or criticize to try to reach a positive agreement to this activity for many is diabolical while for others it is an opportunity for development as previously discussed. 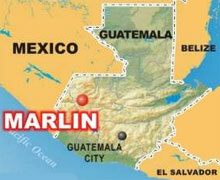 Guatemala is becoming a country of metallic mining resources. A law created under President Alvaro Arzu (1996-2000), opened the floodgates for transnational incursion in the field of mining. With the growth, environmental organizations are pushing for a change to the legal framework that favors companies. They also demand a halt to projects considered cause irreversible damage. Most people who participated in a survey conducted by the firm Vox Latina, San Miguel and Sipacapa, believes that mining will not bring benefits but cause environmental damage. Only 4.5 supports this activity. The Network of Institutions and Organizations Maya expressed strong opposition tomining projects in the open, and denounces intimidation peasants. The area where the mine is worked Marlin is located in the north-west of the country, the majority of the population on the land is devoted to agriculture and some cattle and bovine. The town where the mine is located San Miguel Ixtahuacan and local people of that town is not actually against the mine operates there. Opponents are people living in other towns around San Miguel. The poll by Vox Populi was made not only in San Miguel but elsewhere. Why do they oppose? They object because the mine is doing development work in the communities of San Miguel, providing roads, schools, etc.. in the area and that development does not reach other people that are around, and for them, the suburbs, they also want to make roads, schools, etc.. and though the mining company has done something there, do not reach all people around as they are outside of the project area. Mayan organizations are heavily influenced by foreign people and therefore environmentalist oppose mining express rejection because it is bad for the environment, but as we have seen, it is not. Marlin mine currently has a counter propaganda in the area to raise awareness of the benefits and opportunities provided by the project but has not had much echo in the Mayan Organizations that have already gotten into the bad conscience that is mining. Strong opposition to mining projects open yesterday said members of the Network of Institutions and Organizations Mayas. It was learned that miners intimidate peasants. 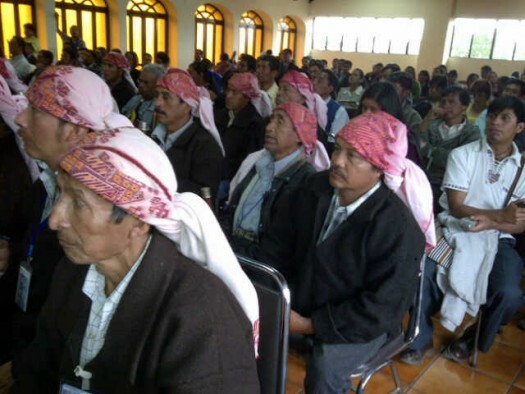 The announcement was made ​​during a workshop, attended by over 200 community leaders in which they explained the advantages and disadvantages of this practice. “In some communities have intimidated miners to abandon the land. They have also offered projects or miserable amounts of money to explore for minerals such as gold, silver, zinc, and others. It is an abuse to the ignorance of the poor, “he said. Miners intimidating the peasants? Not the other way around? It has been known to intimidation and threats to life engineering and technical personnel of mining and hydro electric companies who have been working in the communities of El Quiche that have been “kidnapped” by the communities to enter the villages without ” permission “of the community and have been placed in municipal halls where are warned not allowed strangers passing by the place, let alone whether they are mine or electric because according to those in the community want to steal” water “. Make a meeting of leaders of the people in the room with those captured inside the municipal hall while people shouting outside “Gas!” “Burn them!” “Let’s kill!” At the end have been released on condition never come back to the communities and with the prerequisite of paying to Q.15, 000.00 quetzals or more to be released. In addition, there is a law against entering any region of the country without permission? Or are the people of these communities can not come to any other place in the country freely? Not seen lynchings of innocent people in various parts of the country, especially in the Highlands? Maya and institutions, as we have said before, people are heavily influenced by extreme environmentalists and foreign organizations. And the Ministry of Energy and Mines has given “permission” to several mining areas to explore? Is there no freedom to explore and study the subsurface or own mining laws are established to do this activity? And perhaps the exploration is exploitation? Exploration activity is a study of the land where the geology determines the place without actually extracting mineral wealth but at most several samples of rock or soil that does not weigh more than 2 kilos placed in plastic bags which are analyzed in a laboratory to determine the amount of the mineral elements that are sampled. And they have been offered the landowners a miserable amount of money to work on their land? When it is known that it offers up to 25% of sales of material extracted, the land owner can make big profits without doing all the work is hard work … from the operator (who generally live near the mine) to the carrier can also be local … That is an abuse to the poor? Hilarious, is a great opportunity for the poor, another way of living and economic opportunity and personal gain (continue).